On Christmas afternoon, I arrived at an unfamiliar apartment in Etobicoke. After making my way from the snowy sidewalk onto a narrow path, I found a door propped open with a brick. I hesitantly let myself inside and climbed to the top of a dimly lit staircase. Dozens of shoes cluttered the floor, so I added my own pair of black Converse to the pile, wondering if they’d still be there by the time I left. I followed the sound of voices and laughter and crept down the hallway until I reached another large door. Room 302. When I walked through the entrance, I was greeted by dozens of faces I had never seen before. I don’t usually spend Christmas with a room full of strangers, but then again, I’m not usually able to spend it with a room full of relatives, either. My family is spread all across Ontario and Michigan, which often leaves us celebrating either a couple of days before or after the 25th. A short, Italian woman in her mid-thirties greeted me. Her long, curly brown hair bounced as she smiled. I quickly learned that she was the host, Corazza. More than a dozen people were sitting on the dark hardwood floor passing around pizza and turkey. A small Christmas tree stood in the corner, lighting the vibrant and noisy living room. I joined the circle of travelers. Two people, one from Calgary and another from India, shuffled to the side to make room. I placed the cookies I brought onto the table and hesitantly introduced myself. “Hi, I’m Zoe,” I said. This wasn’t a typical Couchsurfing experience. I didn’t travel to a foreign city and I didn’t need a place to stay, like many of the other travellers I met that day did. But inside that cramped living room on tLhat snowy December day, I found a community among strangers. Like Airbnb, Couchsurfing is a website that connects travellers with locals from cities all over the world. People offer up whatever spare space they have, be it a yoga mat, a couch or an extra bedroom—free of charge. Founded in 2004 by Casey Fenton, Daniel Hoffer, Sebastian Le Tuan and Leonardo Bassani da Silveira as a small passion project, it has now grown to serve over 12 million people in 200,000 cities. The focus of the website isn’t to make a profit, but to encourage travellers to reach outside their comfort zone to fully immerse themselves in a new culture. It represents the more authentic idea of the sharing economy: offer what you can to others and eventually, people will do the same for you. Christopher Beaulieu, a Ryerson masters of media production grad, started Couchsurfing in 2015 while he was teaching English in South Korea and travelling through Japan. A year later, he spent a week in Cosenza, Italy. As soon as he arrived, his host—an Italian man named Alex Adriano—picked him up at the train station. After a 20-minute drive through narrow winding roads, they arrived at an old house in the mountains that had been passed down through generations. Beaulieu planned his trip with the intention of seeing his extended family members, who only spoke Italian. As an English speaker, he was nervous about not being able to understand them, so Adriano translated their conversations. Later that year, Adriano came to Canada, where Beaulieu was able to offer up his own couch—further cementing that travel connection is a pillar of the Couchsurfing community. 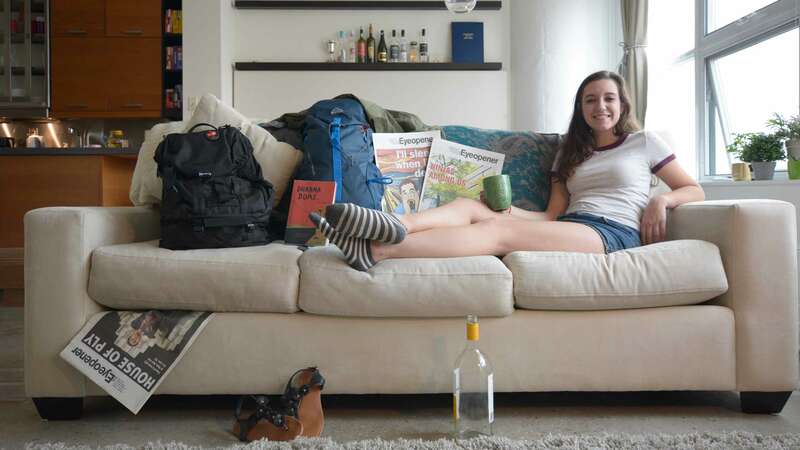 Fellow couch surfer Krystyne Kontos, a third-year architectural science student, agrees that Couchsurfing offers a unique experience for every traveller. “I think it provides such an intimate reveal and understanding of a culture that you wouldn’t have access to with alternative accommodations,” she said. This past summer when she was travelling through Torino, Italy, Kontos and her travel companion found a host 20 minutes outside of the city. After two bus rides, Kontos and her friend found themselves walking along a desolate, stoney path. It had tall green hedges running along both sides. A farmhouse, surrounded by lush, green fields, stood at the end. They spotted a large, hairless sheep being chased by an elderly woman—the property owner. She walked the girls inside the rustic farmhouse, where they met 15 other travellers who were also spending the night, some from Brazil, some from France and some from England. 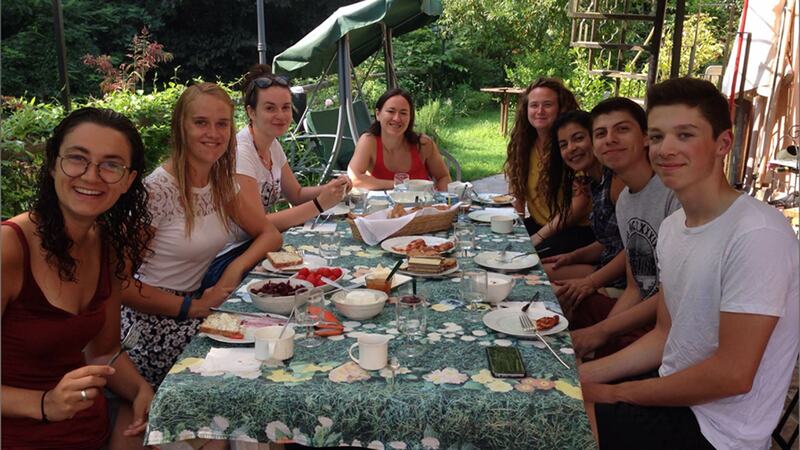 Their host, a woman named Fabiana, prepared a traditional breakfast, lunch and dinner every day for the group, including fresh mountain goat cheese and Italian pastries that they would enjoy outside while admiring the view of the distant, northern mountains. The weather in Torino was often cloudy. A blueish hue draped over the city. A few nights later, Kontos sat around a large bonfire eating homemade rice and chicken with fellow travellers as an Austrian accordionist played music. While some are turned off by the idea of trusting a complete stranger, for others, it’s the only option. When Ethan Craft, a third-year journalism student, set out to travel around Europe last summer, his plans fell apart after a gunman drove a truck into a crowd in Nice, France, killing 86 people. As he was getting ready to travel from Paris to Nice, before he even knew what was going on, he received a flood of messages from concerned friends and family. “I had no idea what had happened, I just started telling everyone that I was OK,” he said. On a whim, he decided to search for his Italian acquaintance Umberto Barachetti. He met Barachetti earlier in the year while travelling by train from Beijing to Mongolia. Craft didn’t have his contact info and couldn’t find him on social media, but was lucky enough to stumble across his profile on Couchsurfing. A change of plans led him south, and after a 14-hour train ride through Switzerland, he arrived in Dalmine, Italy, where Barachetti lives. My entire family and most of my friends think the idea of Couchsurfing sounds ludicrous. I’ve had my sanity questioned and I’ve been told that I have too much faith in people. When I first brought the idea up to my mother, she offered to give me the money to stay in a hostel instead. Like anything, bad stories accompany the good ones. Some hosts have had surfers disappear from their homes without a word, leaving nothing behind but a mess. Other times, hosts bail last minute—leaving travellers lost in a foreign city. Kontos once stayed with a German fellow who liked to tap her with his clammy feet. Other hosts have turned out to be nudists. Despite occasional mishaps, the website is predominantly safe. 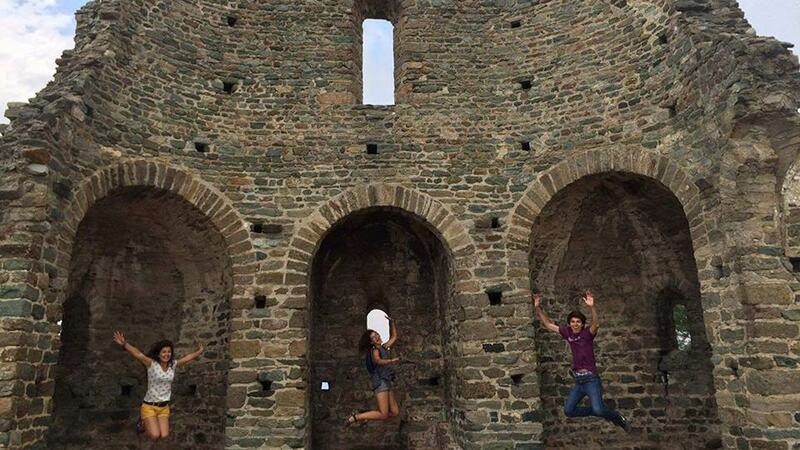 Reviews play an essential role in the Couchsurfing experience for both surfers and hosts. And, as most veteran travellers will say, the best thing a person can do is trust their instincts. As for my Couchsurfing experience, I haven’t had a bad encounter yet. Last summer, I lent my couch to a boy from England. I was nervous about meeting up with a complete stranger, but we quickly bonded over our love of wine and shared a bottle while watching a dubstep- inspired version of Shakespeare in High Park. Another time, I met up with a couple from Prague who out-drank me three to one and offered me a place to stay if I ever found myself in Europe. And, most recently, I spent Christmas with a room full of friends that I hadn’t met yet. 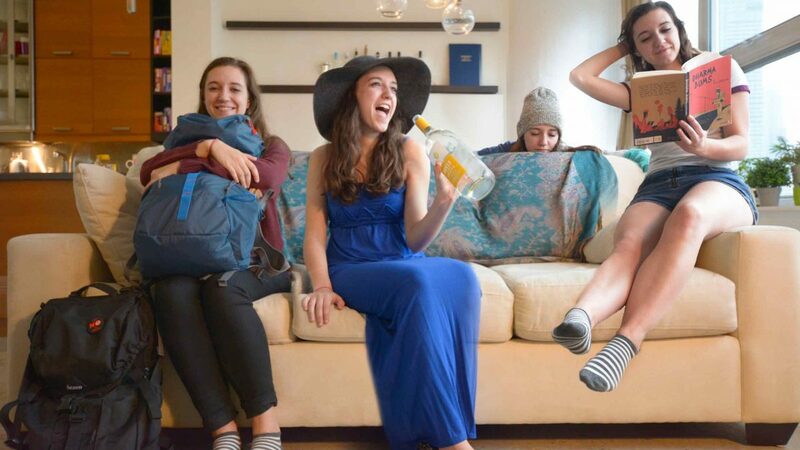 Couchsurfing isn’t a luxury pool with mini-bar access, it’s lumpy couches with homemade breakfast and genuine connections. It doesn’t consist of tour groups and megabuses hauling people from one site to the next, it’s walking through someone else’s life and discovering what the everyday is like for people from around the world. Love this! Can you link the couchsurfing site directly? 🙂 Would love to make it easy for people to check out the site! Great article! To meet local people, you can check out Tripnparty.com as well. The idea : Hang out with local people around the world.